I don’t know how much Europe really influenced my zeitgeist (/worldview/opinions/whatever). Europe was a circuit tour where I always felt like my face was up against a pane of (metaphorical) glass. And, honestly, there’s something isolating and experiential in existing in a neutral zone between cultures (yours and your ‘host’s’). It feels as though your walk changes, your eyes scan at a different pace, and one’s soul tenses. I find cities always feel something like this. Yet in a culturally familiar country one is concealed: abroad, this same sensation exposes a person. You feel as though a part of your being is revealed, open, displayed before eyes recreating you with guttural and romantic language systems you can’t hope to intuit. One becomes aware (in both situations) of the existential gaps in understanding, thought, and meaning between any two individuals, and how deep these chasms truly are. But in the same breath, there’s a comfort in being removed from place. Certain habits of thought, quirks of personality, and routines of action loosen when you can’t hope to expect what the people around you care for or how they consider you. If you can work through the pressure something unwinds from your perspective on reality. The contours of the world relax and the horizon widens. Familiar sights, once a comfort, are like blinds released and you feel as though you can see the world as you ought to. What I’m saying is simple: one becomes more in tune with their place on this planet once they lose the social cues and expectations they’ve thrived upon since birth. Despite the angst, this can be wonderful. I have this stubborn drive to get myself lost while travelling. I’ve stuck to this habit since I was 17, and Europe gave me plenty of opportunity to exercise the wander impulse. Contrary to what most people imagine, getting lost in a metropolitan city (during the day) can be relaxing. My first day in Vienna was sparked by stepping off the bus and realizing that my map of the city had gone AWOL. Believing downtown to be somewhere northeast, and not especially concerned, I worked my way northward. Eventually I stumbled on to an urban walking trail (which are pleasantly common to Vienna) which led me through some of the loveliest metropolitan woods I’ve ever had the pleasure of visiting. This winding, uphill trail took me into a small residential district, and from there I followed a busy looking road eastward. My rationale was that all busy urban roads lead downtown at some junction (I wasn’t wrong; I was maybe 10 minutes outside of downtown). From there I turned downhill (desperately needing a bathroom: every wanderer’s bane) through the longest residential district on the planet. I ended up in a small, smoky bar in a calm shopping and office district, where I discovered that three years of German had equipped me with a valuable skill. Then I saw St. Stephen’s Cathedral, which was gorgeous. Getting lost isn’t nearly as bad as people fear (although, I do have examples of how things can get depressing fast when you’re lost). Getting lost gives you an opportunity to step out of the habit of habit: of needing to be comfortable with your surroundings, to always plan ahead, to never not know for sure what you need to do next. It’s an opportunity to slip out of time and experience something new. Well, its over. I am “home,” in Canada, in Calgary- the land of oil, cowboy hats, oversized trucks, and a general feeling of commercialism. But, it is “home” for right now, right? I’ve got my job, my family, my friends, and my plans. Big plans. Plans to settle down after this great last hurrah across Europe- I mean camping in Europe for 2 months, that’s a right of passage, right? So I’ve crossed, here on the other side, it must mean I am ready to be an adult, right? So I go ahead with my plans, see the apartments, fill out the applications, return to work, even go to IKEA (I’ve NEVER done that before) and pick out cute throw pillows. I guess I’m excited. I guess this is what I want to do. Then a call comes in, the apartment falls through- you’ve got to have some serious assets in the bank in order to convince a landlord here in the “city of opportunity” that you would be a good tenant. I don’t make enough money to rent an apartment in this city. Which is bizarre to me, because my father supported a family of 5 back in Nova Scotia on my salary. Its all relative isn’t it? So maybe I overreact, maybe I do what’s right for me. Maybe travelling across Europe for these past 2 months did teach me something: that my life, is my life! Maybe I did turn 30 this year, but its not over yet! Maybe this adventure wasn’t a right of passage into a “settled” life of fulltime work, and RRSPs, and maybe an annual vacation. Maybe it was a right of passage to a whole new way of looking at my life! Just as the world gets a little bigger when you travel, maybe the parameters of my life also expand- maybe my dreams just got a bit bigger! So I throw the apartment listings section of the paper in the trash, un-bookmark IKEA on my browser, and decide that I do not need to let society tell me what my life needs to look like. Bon Voyage friends! Is Your Life Worth More Than Mine? How do we determine what necessary course of ‘justice’ should be taken against war crimes? What is adequate and fair compensation for the losses of people during and after crimes of war? Is it even possible to compensate for such loss? Looking at the Holocaust survivors or their children and the compensation received by the Holocaust Victim Compensation Fund (HVCF), a one-time payment of the equivalent of $1300 Canadian dollars, we see that people are still healing, still hurting. The loss that was experienced during the Holocaust not only by the Jews but also by Gypsies, members of the LGBT community, protesters of Hitler and citizens of the countries occupied by the German Regime has been and continues to be compensated for people who apply but to what extent can the wrongs be righted? Is financial compensation the right route to take? Look at 9/11, for example, and how specified funds to the Red Cross were divvied up between the families of the fallen (after much controversy) but the formula for which they determined the amount each family would receive was based on the loss of income according to their future projected earnings. Does this mean that one person’s life is not equal to another’s? This was a question being asked by many people during the time and continues to reflect the struggle that humanity faces while trying to right the wrongs done to them. Just a few things I’ve been thinking about. If you are interested in chatting more about this topic please feel free to message me, I would like hear what you think! When traveling, timing can be everything. Being in the right place at the right time could mean three free packets of Roman Ramen Noodles, walking into Notre Dame Cathedral just as a girl’s choir is about to start, or even waving to William, Kate, and baby George as they exit Buckingham Palace (okay, that last one never happened). 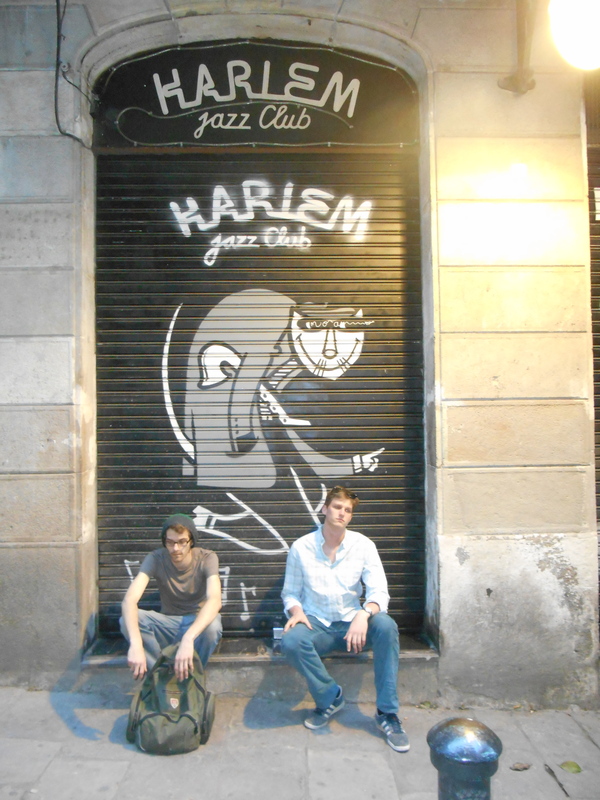 On the other hand, being in the right place at the wrong time could mean missing a protest in Vienna because of leaving the square two hours early, standing outside the closed Harlem Jazz Club in Barcelona on the only night out of the week it wasn’t open, or even walking down the streets of Assisi just after the Sprouse twins from Disney’s Suite Life had been spotted (yeah, that last one really happened). It was at one of these right place, wrong time moments, when Laura, Marrissa, Hayden and I missed the last bus to our campground in Paris because we jumped on the wrong train and had to back track to catch the right one. This “train wreck” ended in a dramatic five minute sprint through the subway, only to have the bus stop’s electric sign trick us into thinking we had made it with minutes to spare. We waited at the bus stop for close to 15 of those spare minutes. Needless to say, our bus never showed up and we realized that those spare minutes had never existed. With the wee hours of the morning upon us, we decided to follow around a guy living in Paris who worked for Telus because we thought he would know what he was talking about. He didn’t. After wandering the streets for an alleged night bus stop and having countless taxies pass us by because we had a fifth wheel leading the way, we finally decided it was time for a tire change and left our Telus guy on the curb. Over three hours had passed from the time we decided to start our journey home until I handed our taxi driver the 15 Euro fare needed for returning us to our beloved campsite. I tell you all this to say that moments, whether they be in the right place at the right or wrong time, always have potential to turn into adventures. SSU Travel semesters lead the way for many adventures, both the big golf ball sized hail murdering your tent type, and the excited we found cheap gelato on a side street type. Both are worth it. I took a few ‘word snapshots’ while on the road in Europe. I wanted to capture the kind of moments that could not be caught by a lens. You know, those moments that happen too fast and you don’t have time to whip out your camera, or when a person or scene is so beautiful but it would be really rude to snap a picture, or maybe it is the day you decide to not take your camera because you want to be present in the moment and not thinking about how this would make a good picture to show someone when you get home. I had a number of those moments while traveling. I had to cement them in my memory somehow; my sloppy words had to do. Here is one of my ‘snapshots’ of a man inside the Basilica at Montserrat, in Spain. He was among those who remained after the boys choir had sung their two beautiful songs. People left in hoards on either side of the pew he sat in. They came, they saw, and now they thought, “Get me outta here!” I suppose I would lump myself in with the hoards needing to get out. Not him. He remained sitting there, near the back of the Basilica. With his head cupped in one hand, he leaned on the pew in front of him. On his face was a most beautiful look of contentment. I walked quickly by, hurried, not only by my own desire to get out of the crowded dark church, but by the people behind me, also eager to see the daylight. Not him. He was not eager to leave. He sat, as if stunned into silence, content to rest and soak in the music. It was as if the music still bounced around in his head; he stared out and watched the notes still reverberating and bouncing around the church. Sometimes you don’t know what to say or how to process all of the things you are feeling and thinking. I will be honest and say that beginning to process this trip has proven to be a challenge on par with experiencing the trip itself. I do not believe I have felt more alone in my entire life than I have these past few weeks. When I was traveling throughout Europe with thirty people I was irritated with the lack of privacy and space; now that I am home I am surprised by how much I miss all of the beautiful people that I had the pleasure of spending the last two months with. I have been in a rut, one that has encompassed the normal day functions of life and has made it seem impossible to complete my homework as the last thing I desire is to dig deeper into my post-trip feelings. Now I must do so. I spent the first few days at home in a whirl of feelings that I wanted to ignore: what’s my purpose? Is it to binge watch gossip girl? Probably not.. ha. Now that this initial moping has passed I am ready to continue my life and work towards the things that drive me. At first I thought this meant jumping on the next international flight I could find a seat on and continuing my adventures without taking the time to slow down and face the mundane. I realize now that this is not the answer. For me at the moment I think being home is about moving forward and allowing myself to enjoy the mundane. Today I met a guy on an adventure himself, he is biking across the coast and we began to talk about how people can live in a town their whole life and never appreciate the beauty of it; I do not want to be one of those people. If I wasn’t forced to slow down from time to time I don’t know if I ever would. This reminds me to be thankful for my homework and a small coastal town that has supported me in my travels and welcomes me home with open arms after every return. Looking back on the trip after having traveled solo in Holland and having spent a couple weeks at home, I realize that while I still struggled to be able to love my fellow travelers in the way that I felt they deserved, I did the best that I could. I am also coming to the realization that perhaps they were having similar struggles – a realization that hit me after having conversations with some of my classmates and reading some of their blog posts. So I wasn’t alone, and maybe that provided us with some small sense of solidarity in our common struggle. Here I am after the trip – here we all are. We all survived and as far as I can tell, our friendships are still intact! I know that I still love everyone, and I hope they feel the same. So maybe I made some small progress. That transformation certainly will not stop simply because the trip is over. I will continue to strive for improvement in my loving capacity. I am hopeful that I will get better at it with time! 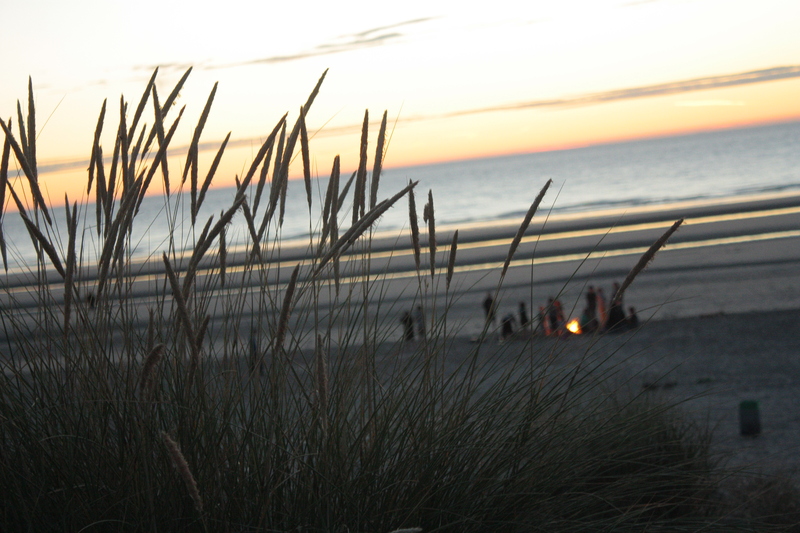 One of our last gathering times on the beach by our campground in Belgium. Along the trip there were not a lot of opportunities to spend time alone. When you’re camping with thirty other people there are not many places to hide. Because of this constant group immersion, a little ‘me time’ can go a long way. This is why I chose to fly solo during our day in Assisi, which also happened to be my birthday. We spent the first part of the day in San Damiano, which is the church that St. Francis repaired and lived in for some time, now serving as a monastery for Franciscan monks. After a liturgy and some quiet reflection on the hillside, I felt primed and ready for a day of introspection. I took off on my own and walked up one of many large hills in the city. Something about the human condition seems to drive us to high ground. I often feel this incessant need to reach the highest peak or tallest building, and so I continued on streets that would lead me further up. Eventually I reached a fortress that I had seen from the streets below. I stood there amidst the birds looking down on miles of Italian countryside. From there I meandered back down to the city and found a trail that took me lower still through many switchbacks and hills that would lead me to the fields that I had previously seen from the fortress in the sky. The end of the trail brought me to a small chapel beside a river. This was not a place to cross off a list of tourist destinations, I’m not even certain it had a name. I entered the humble church on that Pentecost Sunday and sat in one of the pews. I was the only person there, but I did not feel lonely. In that small building I took a break from the world, and was allowed to simply be.